There are many that will tell you that you can't do a good job with a home alignment. Since there is limited adjustment for camber and caster adjustment while doable should not changed unless there has been damage, toe is the main adjustment most should have to worry about. Anyway slid into and on top of the island with a good bump. My toe had been off and pulling a little bit to the left. Was going to check it out when I replaced the lower bushing in a month of so. Now of course if was off a little more. Well actually a lot more then I liked. So knowing the toe was way off, when I got home today I decided to set it right. Here is the method I use and done right I bet you can set toe every bit as well as a shop can. Since toe is the biggest setting that makes a difference in your alignment this can save you a lot. The other thing about doing it this way it does not matter if the car does not have the same wheel width track in the front and back and you can check the toe of both the front and back at the same time. Update note 12-5: I didn't recheck the adjustment until after driving the next day. I had over adjusted the toe on the LH wheel just a bit so needed to take a little toe out. Many say this way takes to long to setup. Since I knew the distance from the hub to the string after doing it the first time, the setup and adjustment took me a total of 10min. from start to finish. There is no way a shop could do it that quick on a machine. You run a string around the nails so that you end up with two strings parallel to the car body. Now you have to take your time and carefully adjusting the boards so that the string is exactly the same distance from the center hub of the back wheels on both sides and the front wheels on both sides. This requires going back and forth from the front and back until the distances are exactly the same. If the wheel track between the front and back wheels are different just make sure you keep the distance of the left and right sides are the same. Take your time here. This step done right is what makes it the most accurate. It just so happens that the front and back track of the Fiero is almost exactly the same. All the below pictures are taken on the left side of the car since that is the side that needed adjustment. The front of the wheel will be on the left in all pictures. The left and right front and rear distance from the string to the hub where the same at all wheels. When you have the strings set, you can then measure the distance from the string to the front and back lip of each wheel to get the toe reading. For standard "toe in" or slightly positive toe the distance from the string to the front of the wheel lip should be greater than the distance from the string to the rear of the lip. Here is what the rear wheel measured. Right at zero toe. And here is the front one that is out of wack. As you can see the front measurment was almost 3/8" less than the rear. I have used this method for years to set my toe and get great life out of my tires all the time. If you have to make adjustments to anything you have to be sure and recheck the centering distances to keep the measurement accurate. Your wheels have to be true and not bent or damaged of course. After making adjustment to the alignment I take the car for a drive and then setup again to verify or re-adjust. It is also a good way to quickly set the toe close if you want to drive to a align shop after changing parts and don't want to speed a lot of time getting it right on. Or set it right on and see what the shop says the toe looks like before they start! UPDATE: Drove the car to work this morning. Steering wheel was perfectly centered once again... Life is good.! Keep the painted side up ya hear! Excellent post. Just one tip, throw some plastic shopping bags under the tires. Makes adjusting the toe alot easier cuz you don't have to fight the tire draggin across the concrete. Another great recycling uses for those shopping bags...! And I already use the tiles for turn tables. Or get you some of the heavy duty 12" x 12" floor tiles, and put two under each wheel, with a shot of grease sandwiched between them. Lets the tires turn and slide alot easier. Great write up and much better than the scribe a line on the tire method I have used in the past. It consists of a 30-inch pendulum fastened to a piece of wood, with two long wood screws in the side of the wood. I made the pendulum by brazing the long rod into a smaller piece for the pivot, and drilling a hole through the smaller piece. It is fastened to the wood with a small nail so that it can swing freely. The two screws are at exactly the diameter of the outer lip of the wheel rims. The important thing about the pendulum being 30 inches long is that � inch of movement at the pendulum end represents an arc of 1 degree. This is the bottom end of the tool. 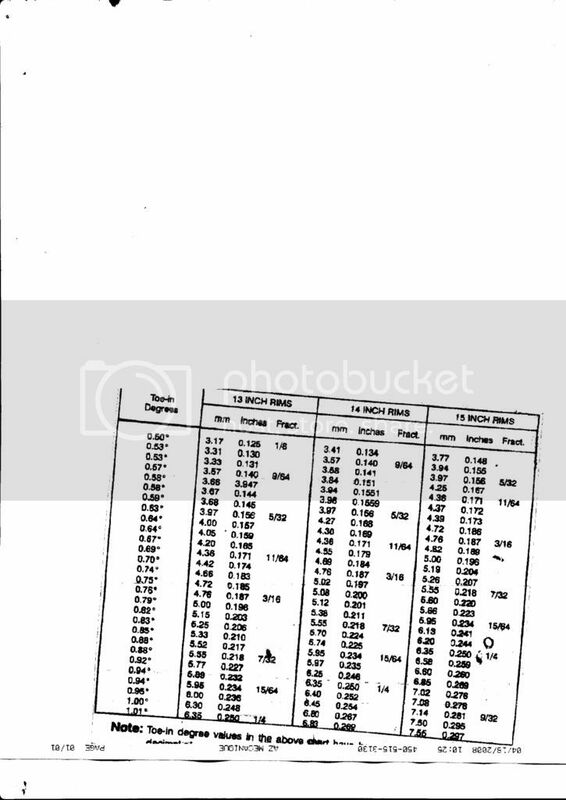 I have marked the center and intervals of � inch (1/2 degree) and � inch (1 degree). The first thing to do is calibrate the tool. Basically this involves holding to heads of the two screws against a vertical surface, I used the garage door frame after checking it was in fact vertical, and screwing them in or out until the end of the pendulum, which is hanging vertically, aligns with the center mark. 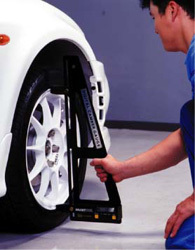 To use the tool, you place it against the side of the wheel so that each screw head rests on the lip of the rim. Here you can see my lovely assistant holding the tool in the wrong place, because the top screw is on the tire and the bottom one is on the side of the lip, rather than the lip itself. The reason for using the lip of the rim rather than the sides is that the sides slope in on my rims, so that by positioning the tool on different parts of the rim you can get different camber readings. Obviously that is not good. By using the lip of the rim you ensure that you get a consistent reading each time. I've done that also. It helps to have the car setting or adjusted so it is setting as level as possible.. But I wanted to see the lovely assistant! Now if I was CSI I'd pull a reflection off the side of the car and enhance it so that it was perfect. Eveyone can do that right? Here is another write up someone did that is in the archives. The question I have is on most cars it seems to get caster you measure the camber with the wheel turned in and out 20* from straight and subtract the camber angles to get the caster angle value. I have never seen a writeup of what the Fiero or GM method is. since i cant seem to get a good alignment around the freakin town i'm gonna try this next time. One thing to note is to lock the steering wheel in the correct position or you may align both front wheels with the steering wheel off vertical. Setting toe-in? A simpler method is to do the same thing the NASCAR guys do ... but it usually takes two people. Two flat boards, one held against each wheel, and two tape measures beneath the car. Me? 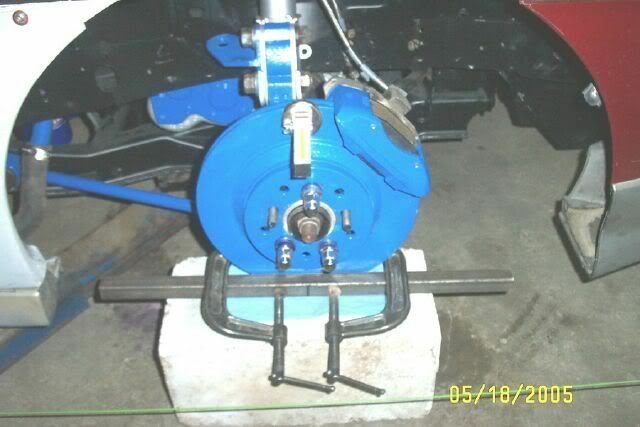 Back in the 80s, I built a large aluminum adjustable caliper to measure the front & rear edges of the wheels. Rear wheel toe-in is more fun because then you have to adjust them relative to the car's centerline, and not relative to each other. Still, this was a good write-up. The plastic shopping bag idea has worked well for me, too. Steering wheel not centered? Once you've got the toe-in adjusted between the two front wheels, simply turn both adjustments on the tie-rod ends the same number of turns until the steering wheel is straight up again ... may take a couple or three tries to get it right. i just did this last night. but i didn't use any 2x4s. i just used 4 jack stands with string. i got the strings even away from all four centers of the wheels, right next to the where the center caps go in. unless i'm missing something, it should still work because i'm making a symmetrical parallelogram. guess i'll find out tomorrow. Did you find your toe off? The only problem it might not show is if there was any frame damage to was causing dog tracking or inset wheel like a bent cradle. I know they a little spendy for most people but they will pay for themselves by the first or second time you use them. Not including the time they save. I have use the string method and had very good luck with it but once I bought a set of these I realized how much easier they are to use and will never go back to the string. Just make sure they are square, jack up the car and set it down on top of them. Make sure your steering wheel is straight and make adjustments as necissary. Works like a charm. Didn't know if you guys knew these were out there or not just thought I'd throw it out there just in case. EDIT: I also place a 1x8 or whatever I have handy under the tires the plates are not under to level the car. I have found that it is a little more accurate then the string method. I use to use one of those in high school years ago working at a station. Was for auto inspections. Here is some infos on degree and equivalent for 13" 14" and 15" wheels . If this is something you're doing somewhat regularly, there are MANY products out there to do it properly and quickly. Longacre's Catalog has tons of caster/camber gauges, bump-steer gauges, etc. There are also many "on-wheel" gauges out there, like this one from Tein. Adjustable control arms (usually tubular) are a major help in this as well, like these from Held. Some good write-ups here, though, and there's nothing wrong with DIY; as long as you're very precise in what you're doing. Not only can a bad setup cost you time on the track, it can make your car handle unsafely, and will wear your tires and suspension components prematurely. Project IMSA Formula Coming Soon! Crap, I'm out of Fieros! Time to buy another!! - "Your mileage may vary." I know this is a dumb question, but how do you get in to adjust the components with the strings up and the wheels on? When I do my alignments (Wire attached to conduit and pulled tight), I remove all 4 wheels, use the lug nuts to hold the rotors tight, rest the car on the rotors on blocks and bounce it to make sure everything settles, then bolt on 24" long 1x1 square tube to the rotors and take all measurements from these bars. This gives me easy access to all the adjuster bolts, and my readings are taken 24" apart to help provide more accuracy. Buddycraig I don't think you can just make the string the same distance away from the wheels centers. On my car at least the front is narrower than the rear by a little, which would mean you actually created a trapezoid. Old I know but the reason dodge runner uses boards and screws for the string is to make sure it actually is a parallelogram. In the rear I set the string 30mm from the hubs and up front to make a rectangle it was 41.47mm from the hubs IIRC. I use some digital calipers to take all measurements. I set everything up for 0 toe all around. At highway speeds I don't love it because every teeny steering input make the car turn. It is really nice at lower speeds, super responsive. When I raced Nascar, we did rough alignment with just a piece of string. We ran it across the front of rear wheel (touches 2 points) to across the front of the front wheel (also touches 2 points) up even with the centers . If it touched all 4 points it was straight, then you could adjust the toe by measuring at the rear point of the front tire. You would do both sides the same. It was even called 'stringing' the alignment. Toe in wont cause a pull to one side. Something is either bent, or caster/ camber is off. If toe is off, when you drive it will tend to center itself to be off the same amount on both sides so no pull, but will be unstable & wander. Nascar was around in 1922? I just want to know how you guys get under these things with them on the floor to adjust the tie rods, and others? I mean there is no room to get at the parts except in the one where he put the thing on cement blocks with the tires off. I ask because I have to do this myself soon or replace my tires, AGAIN. I have one rear wheel with the tire so far out its wearing on the inside and one wheel on the front with the toe out real bad. Detroit iron rules all the rest are just toys. An easy way to adjust just the toe is to measure between the center tread on the front side and backside of the wheels. I use a tape measure and a buddy to hold it. Takes like 10mins. I can get it within a 1/16 usually. Then I take it to the shop for a full alignment. This way I don't murder my tires after doing lots of suspension work. I had the same problem reaching under the car, with no alignment rack. I cut four pieces of Al plate, about 20" x 6", 1/2" thick, bored them for my hubs, drilled the bolt pattern. I jack up the car, replace the wheels with the plates, use a piece of UHMW with a groove milled in it to fit the AL plate at the bottom of each, resting on some scraps of granite - usually with grease. Easy to adjust camber, just a piece of rod with threaded ends, nuts on inside and outside of plates, running under the car from "wheel" to "wheel" - turn nuts to move wheel. Toe is measured between a couple of pieces of Al angle, clamped to the plates.